Nice little Youtube channel of someone who cycles in to Edinburgh with a camera on their head -sometimes they film the drive for comparison. The footage is all a bit dark -if you are wondering why there are so many cars driving around in darkness, that's scottish winters for you; the films are probably taken at 08:45 in December with daylight some months off. It is either an argument in favour of helmets, or in praise of maintaining some distance between you and the vehicle in front, especially if the vehicle in front is bus. Remember: whoever crashes into the back of someone else is viewed as liable. It's interesting that there so many buses in these videos: a reminder that there are some cities in the country the same size as Bristol which have a functional bus service. They're getting a tram line too. Luckily, the driver of this car, X5SNN, is almost certainly aware of this defence and would be able to argue that, although parking all day on Double Yellow Lines may constitute an offence, parking at the same time on an area of Hatched White Lines (which should not be entered unless absolutely necessary) is a separate offence. This is, therefore, not committing the same offence twice, or being tried for a single offence twice, but committing two offences simultaneously. Our strategic partners, the Association of British Drivers, have a special dislike of Bus Lanes. They make some valid points. One of their criticisms, for example, is that they make buses more popular, hence more people get on them, hence the bus gets slower. That is an important issue, for which all existing bus passengers must thank the ABD for looking after their needs by fighting bus lanes. Another criticism is that they slow down traffic by creating congestion, forcing two lanes of traffic into one. That's a bit simplistic, as Amdahl's Law implies that the bottleneck is always the single lane stretches: you have to make everything dual carriageway. Still, the idea merits investigation, on the showcase A38 route, down at the Arches. Here we can see that they are in fact of so little value, even the buses do not use them. The problem is that solid lane markings mean that car drivers cannot use them. The double yellow lines mean that law-abiding car drivers cannot park in them. This means that only drivers like that of L794FWO who refuse to recognise double yellow lines park in them. which renders it useless to buses and taxis, and is of no value to anyone wishing to ignore the restrictions and drive down it. Yet it is still of no value for anyone wishing to park legally. Clearly the solution to this is to downgrade it from a bus lane to a car parking lane, so that anyone can park there. That way, it will have some value at least. Right now, with even the buses blocked out of it, it is a waste of valuable road space. We are very grateful for the ABD drawing our attention to this problem, and encourage every grateful bus user to contribute to this forward-thinking organisation by purchasing one of their recommended driving CDs. So, here we have it. Unambiguous, clear and obvious. Cyclists should dismount and throw their machines over children and adults alike. Or cyclists should help remove and dismantle the sunken railway lines. Or cyclists should consider other path users whilst imitating E.T. and avoiding sunken railway lines. Question is, what are they trying to photo? Our fellow-travellers, the Association of British Drivers, think that bicycles should have a license and pay tax. Presumably they want the bikes to pay tax so that they have a right to use the road which complicates the whole pedestrian crossing thing. Should pedestrians pay a tax too? This is something to investigate. Number plates though, they would be handy. You are actually required to have them if you live in Switzerland, but it helps pay for the armed bike police, which certainly ensure that nobody cuts you up on a bus lane. Why is Bristol Traffic interested in bicycle number plates? It would let us name and shame the two people seen pushing their bicycles up Nine Tree Hill at 08:57 on this sunny Wednesday morning. But given that some the contributor who took this photo seemingly goes home a different way just to avoid Nine Tree Hill, it is hard to shame them. They are pushing their bikes up one very steep hill. There are less than nine trees on it. There are some very nice pubs and cafes nearby. It is believed to date from Roman Times; going onto Fremantle Road and hence onto the port at Sea Mills. If true, people have been suffering up this climb for two thousand years. It is believed that in the 1970s, the ill-fated Outer Circuit Ring Road wanted to run their dual carriage way up here, through Cotham and hence to Clifton. The square at the top, Fremantle Square, is where one of the Royalist forts that defended Bristol during the English Civil War stood. It is that fort and the civil war that merits a mention today. Because today, January 30th, is a day for anniversaries. First and foremost: January 30, 1943: the surrender of the German 6th army at Stalingrad and hence the turning point of the Second Word War. If Putin wants to remind the Davos audience of their obligations to Russia, that event of fifty-six years ago is the one to mention. Closer to home, it is the 360th anniversary of Britain executing King Charles I, and hence becoming, if not a Republic, a Commonwealth. Which those days meant shared assets, not the shared ownership of the Royal Bank of Scotland's 1.4 trillion pounds worth of liabilities. This roman road then, with its monument to a civil war fort at the top, is a reminder of the history that lies round this city, and the fact that as far as this road is concerned, England becoming one of Europe's first modern republics is in fact a recent event. It is also why alongside the People's Republic of Stoke's Croft, should stand the Commonwealth of King's Down. Or Boiling Well's Lane. That's a bit of a muddy walk, but leaves you up on Muller Road. Once its finished, there should be less bike/pedestrian conflict. While cyclists may not believe such conflict exists, talk to those who walk it and their walks in the dark are tempered by their fear of the unlit bike coming down behind them at speed. By closing the path until the clocks change, this risk is reduced. The existing bike racks in Gloucester Road now have some more racks added alongside them. As there is existing trees and phone boxes in the area, they do not take away through routes for pedestrians. The new bike parks provide an ideal place for cyclists to stop, especially given that just after the new racks the bike lane comes to a halt in the form of the taxi WU57YGO. This is where Woodland Road meets Tyndall's Park avenue. 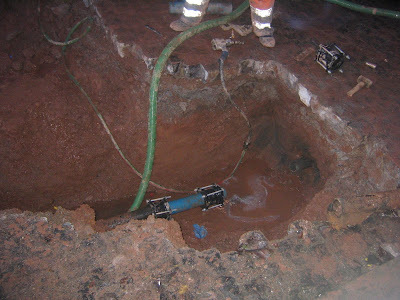 Due to the fact that a very large water drain tunnel goes underground here, there have been ongoing roadworks for some years, right across Sustrans NCN route 4, and a popular walking/cycling route. We've discussed crossing this road before. Cyclists dismount, the red sign on the left says, which is a request, while the sign on the right says Cycleway Closed Ahead. This is technically untrue, unless you have a very loose definition of "ahead", because the cycleway is actually closed in front of the sign -not behind it. And what, play tell, lies behind the sign? This is where it gets interesting There is some crane, some building work. But also, a large stretch of pavement fenced off. Why? So that the people who are working on the site have somewhere to work. They know that if the pavement wasn't fenced off there would be nowhere to park, and hence alternate transport options to and from work would have to be considered. Like, foot, bicycle or even bus. All of these options would be unacceptable. Therefore, a large stretch of pavement has been fenced off for car parking. What we have here, then, is a longstanding roadwork that takes away the primary walking/cycling route to the university, is covered in no-bicycle signs, yet quite happily takes away a stretch of pavement so the people who work on it can park their cars. Why? Because it is more important that these three people get to drive to work than have the thousands of students who cross this junction on foot or bike get across safely. Priorities, see. The priorities you set provide an implicit message on who is important, and who is not -and students come near the bottom. The only hard question is who comes out lower: students walking to college, or students cycling there? Last week a sign popped up, telling people not to park on the pavement on Brook Hill. Does it work? This means that there is more than enough room for vehicles to get past. But even if the sign actually applied to this side of the road, given that the pavement actually runs out just past the rear wheel of the car, well, it's not actually any use as a pavement, is it? This Honda RJ55KAO is not actually parked on a corner, because more than half of it protrudes past the junction of Belgrave Road and Woodland Road. Therefore, corner parking restrictions do not apply. Woodland Road is part of Sustran NCN4, the primary walking/cycling route between student's at Bristol University's Hall of residence -a mile or so up the hill in the direction of this photgraph- and the university itself, just behind the camera. The Bristol Cycling Campaign considers this a strategic walking/cycling route for students. The person who parked this car clearly agrees, and thoughfully left enough space for someone to squeeze through in front of them. You have to fix it wherever it breaks down. Fortunately, the Eastern end of Fairfield Road, Montpelier is wide enough to sustain trucks, camper vans and caravans on both sides of the road, so it is not inconveniencing anyone. What is scary is that someone was under this vehicle last night doing repairs, at night. Look how safely it is held up: bricks and a couple of bits of metal, and imagine what would happen if a passing vehicle were to accidentally clip it, all of that would come down on top of anyone unlucky to be underneath. Not good. This is why garages have lots of equipment to life up vehicles or pits to get underneath them. This site runs Google Analytics. Google track your movements round our site, they give us some of the tables, in exchange they track your movements across lots of sites. If you really want to opt out, search for how to edit your host tables, and for 38% of the readers, stop using Internet Explorer. Get Mozilla, tell it to save cookies only until you close Firefox, then get the FlashBlock and AdBlock plugins to remove the clutter. We see the data, but don't work out the network addresses of whoever leaves comments, or things like that. We just note who refers to us, which organisations like to visit, and what pages are popular. And what search keywords find us. The top ones "Bristol Traffic", "Bristol Traffic Blog" are predictable, then we run through timely news topics, and are slowly taking over the searches for bits of the city. We see the same searches repeatedly. Hello? whoever searches for Luke Weyman or the car reg# WR56UUH? Can we point you two to another Google service, Google Alerts. They run whatever search you want, every day, and email you when new answers pop up. Don't waste your own time if there is a machine willing to do the work. What is most entertaining are the one-off entries, where people searching for things somehow end up on our web site. Here are some of the funny ones, with commentary. For anyone searching as a precursor for a potentially criminal acts (massage parlours, hacking speed limiters), do note that UK ISPs are now logging all requests made of the search engine for 2+ years, the only ongoing debate is where is the data kept: at the ISP or in some datacentre belonging to the authorities. But Google know who you are already. "i have been issued with a parking ticket by cctv camera is this legal in bristol"
Yes. Congratulations, you are one of the first to be ticketed this way! "is it ok to park to disabled parking in bristol after 8? " Unlikely. Why do you ask? "is speed camera in gloucester road north filton working? " wait 3-4 weeks and you will find out. Drop us a note. "will a range rover fit in a council garage"
Depends on how much you value the bodywork really. Borrow somebody else's just to make sure before you get one of your own. "parking in a police vehicles only area offence bristol "
wouldn't park there, even if it is next to Broadmead. "on road dvla camera how does it work "
Cameras, ANPR, recognition kit in a rack in the back of the van, small hard disk of all cars with tax disks, updated every so often. Beeps the driver when there is a problem, they get out and clamp your vehicle. "mileage tampering machine for vehicle in germany "
"hack the speed limiter "
" mot speed limiters "
"software for speed limiter volvo "
If it became compulsory, everyone would be doing this. "are there any good massage parlours in bristol "
"lower ashley road bristol massage parlour "
Nothing to say on these except worry about why they end up on our pages. 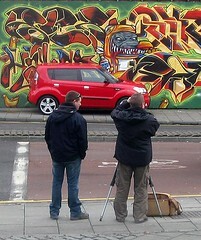 We are not documenting that part of Bristol, though the advertising revenue/commission may make it worthwhile. We don't know who you are, but stop it. We replicate it here, so its irony can be celebrated, especially the bit marked in bold. The West of England Partnership is developing a proposal to create a 16 km rapid Bus Rapid Transit route from Emersons Green in South Gloucestershire to Ashton Vale in Bristol. The aim is to cut congestion on the highway network by offering a high quality public transport alternative to the private car for commuters and visitors. Now the idea is to be developed into a full proposal for consultation. Part of the proposal involves running alongside the Bristol to Bath railway path. New high quality, low emission vehicles would run on a dedicated guideway alongside the cycle track, which would itself be widened and improved as part of the scheme. Councillor Mark Bradshaw, Bristol City Council's Executive Member for Access and Environment, said:"I understand the concerns expressed by many people concerning the Bristol to Bath railway path and the proposals for a rapid transit link. The cycle path is a strategic route in its own right and a powerful symbol of our city's need to find alternatives to the car. “We will continue to work with cyclists, environmental and other partners in preparing more detailed proposals for how the cycle path can be enhanced and co-exist with the rapid transit link. There are other examples of where this has been achieved and we have enough expertise in our city to make this a reality. “As a strong supporter of sustainable travel choices, this council wants to ensure an effective rapid transit network can be realised, alongside promoting other transport choices such a cycling. “It is possible that the rapid transit link could enhance use of the cycle path, making it easier for more people to use the path by combining a cycle and transit trip. We want to do all possible to improve the cycle path and make it easier to use. There we have it: combined cycling and transit journeys could improve the railway path experience. Readers of this site are encouraged to explore this possibility by trying to get a bicycle on a FirstBus bus. We mentioned the extent of the 20mph zones earlier, and the debates raging on Bristol's blogosphere on the relative merits of the proposals. 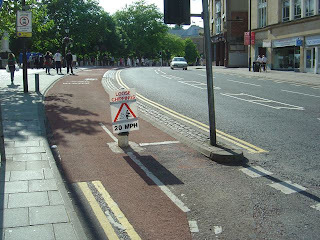 What many people may have missed, however, was Bristol City Council's innovative but unpublicised trial last year, right in the centre of our Cycling City. To be fair to the Council it's no wonder the new zones are being introduced as the trial proved 100% successful in keeping cyclists riding up Park Street below the new 20mph limit. Proof if proof be needed. There have been lots of arguments in the letters page of the legacy-local-press over whether Bristol is anti-car or not. that argument can go all day, without data to back it up. We in Bristol Traffic aim to provide that data, and here have proof that Bristol Council is pursuing anti-car policies. Here is Lockleaze. As you can see, there is no pavement on this side of the road. This means that cars are forced to park on muddy grass growing right next to kerb. This gets the car and the driver all dirty. And it is all the fault of the council. If they would only provide nice pavements to park on, this situation would not arise. Furthermore, it is discriminatory. Clifton: pavements to park on. Montpelier: pavements to park on. Kingsdown: pavements to park on. Lockleaze: mud. Need we say more? When, eventually, the letter turns up telling you that you have a physiotherapy appointment at Hampton House, on St Michael's Hill roundabout, they warn that parking is not available, and that you should find alternate transport options, such as the free bus from the centre. Well, you could walk, but it is a the top of a very steep hill: from here, every way is down. Some people do walk though, because they know that the key concept of physiotherapy is "getting better through exercise". Which is why this delivery van to Hampton House is actually contributing to the recovery of the patients. By parking on the pavement, just opposite the pedestrian crossing, all patients walking to the hospital from the North have to veer around the van W57JYG. Which means they have to stop, to turn, to start, to walk, to slow down and turn again, and continue on their way. What would be a couple of steps -no real exercise- now works all those leg muscles. This shows how not just the hospital, but the infrastructure around it, can help the patients. There's a scooter using the parking area in the foreground, the large van ﻿S217UVW using the primary van interchange area, and the stream of lights to its left are the tail reflection lights of a bike skirting past it. in the distance, the famed range rovers of Montpelier, LO08YXR and YJ52HYE. It's so joyous to see a Bristol community at harmony with itself. One of the jewels in Bristol is Clifton Down, which is a lovely place to walk, climb, run or play football. But not cycle. Because these paths are too narrow and it will endanger all the other users of the park. We in Bristol are lucky that the Bristol Downs management committee has resisted attempts by these subversives. 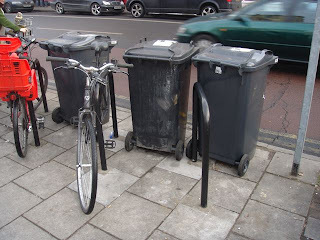 However, the plus side of this new provision is that the existing bin stores on the Gloucester Road are under less pressure from cyclists wanting to park their machines. On a bad day these bins used to be virtually forced into the road by parked cycles. Now, however, they retain their rightful places - separated from each other by Sheffield stands, and only marginally encroached-on by inconsiderate bicycle users. 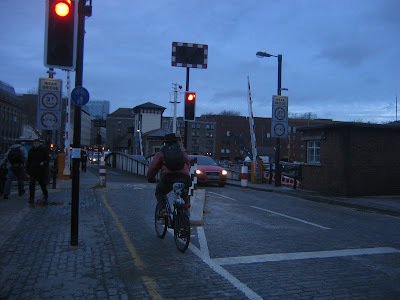 Green Bristol Blog informs us that the cyclists caught running lights in Gloucester Road have been added to the Antisocial Database. And well they should. Nobody should run red lights, except here, on Prince Street Bridge. The cyclist below actually stopped, which shows how well behaved the majority of cyclists are. It's only a few that are trouble. Still, adding subversive bicycles and their "fellow travellers" is a start. First they start campaigning for their own "civil" rights, next they start trying to seize power. Over in the US, it turns out that in the state of Maryland, campaigners for bike lanes were added to the federal database as terrorists; the state government spent money infiltrating the campaign groups with undercover agents. Cycling groups should beware of any campaigners who bring laptops to meetings and appear to be able to touch type, that being how they record statements made by the enemies of the state. 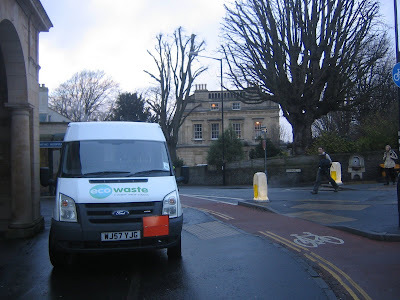 Consultations with someone who walks and pushes their multiple offspring from Montpelier to Cotham every schoolday revealed that two areas they have trouble with are bikes running the pedestrian crossing on the arches, so endangering the children, and bins on the road. So stopping anyone from pushing a push chair down here. This helps the owner of the golf, who knows that nobody will accidentally bump a small child into their vehicle. ﻿When the Kingsdown CPZ/RPZ gets rolled out, what will happen to vehicles like this white transit van R192RGM, whose driver has popped into the newsagent to the left of this picture, apparently to get to get a can of soft drink? (a) As commuters will no longer be able to park in Cotham Road south, residents doing shopping trips will be able to park safely, instead of on the zig-zags of the zebra crossing. (b) The vehicles will have nowhere to park, and will not shop here. Without the provisioning of short-term parking spaces, local shops like this will lose all passing motorist trade. Given the economic situation, all plans to roll out resident parking should be fought tooth and nail. (c) It being a Saturday, passing road traffic will be able to find a large amount of parking space and park legally. Nobody will have any legitimate reason to park on the zebra, other than laziness and a wilful disregard for pedestrian safety. Today, in Westbury on Trym, the funeral will be held for Nick Abraham, who was killed while cycling on the A4 Portway earlier this month. Nick Abraham the climber. There isn't really a cycling "community" in Bristol -there are groups that follow their own niche -road work, BMX, fixed wheel, MTB, etc, but for most people it is just a transport. The loss of a cyclist is an abstract "that could have been me" thought for most. There is, however, a very strong climbing community. Winter evenings and weekends spent at Undercover Rock in St Werburgh's drinking tea, eating chocolate flapjack and staring at overhangs graded F7a while you wonder if you will get up it or end up ignomiously hanging upside-down with the rope wrapped around your leg. You get to recognise the regulars, say hello to them in the wall, or the pubs nearby -the Farm and Miner's Arms. On summer evenings, Avon Gorge, as you communicate by tugs with the climber on the other end of the rope, traffic noise getting in the way of shouting. You see a lot of the A4 portway and the traffic on it, before you end up, with the other climbers, at the Avon Gorge Hotel for a beer afterwards. Summer weekends: Stanage Edge, Pembroke, the Gower. Then there is the Alps, which are where, along with caving and scottish-winter-ice work, that objective danger lies: danger that you cannot entirely eliminate. Because there is danger out there: one of the founders of the wall never came back from a caving trip, there are other people in the British climbing community, known from those places you end up on weekends, that end up not returning from a trip to Chamonix, lost in snow or ice. The climbers do live with that, do have to live with getting that phone call telling them that some of their friends and climbing partners are no more. This is not a sport, it is a lifestyle, one that does have danger, danger which caution with ropes and teamwork can effectively eliminate from cliffs like the gorge: non-friable limestone with good protection. All the subjective danger can be removed there, which is why it is a safe place to learn, to play with your friends, to teach your kids. Sadly, it is clearly not a place to cycle safely. And so someone who was part of the Bristol climbing community will now have to live on only in memory of the climbers, his friends and family. They -we- will remember him, and hopefully soon someone will climb a new route in the gorge, a new way over the portway, and remember "Little Nick" by naming it after him. Nothing else would be more apt. Steve L, undercover rock member #536. When the Kingsdown CPZ/RPZ gets rolled out, what will happen to cars like this one T612JCV? (a) Commuter cars like this will no longer be able to park on the pavement over double yellow lines within the zone. (b) Resident cars like this will no longer be forced to park on the pavement over double yellow lines within the zone due to commuters taking all the legal parking spaces. 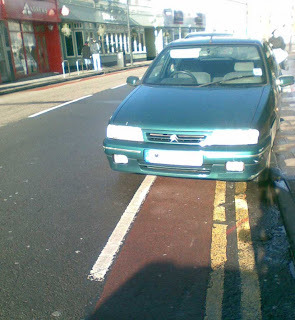 (c) It being a Saturday, anyone will be able to park on the pavement over double yellow lines within the zone. It is illegal to park causing obstruction to the footpath or highway. Any vehicles committing these offences will be issued a fixed penalty notice and removed. Owners will be liable for cost of recovery"
Does it work? Well, there are no cars on one side of this narrow road. This could be viewed as a success. Unfortunately, we have no photographs in our datacentre showing any vehicles parking on this side of Brook Hill -it has not come to our attention, presumably because anyone doing so would make the street impassible and create trouble in the streets. Yet there must have been enough of a pavement parking problem on Brook Hill for it to merit a sign, or the police have been pressured to do something about the Montpelier Problem, and chose the least controversial location. We encourage contributors to keep an eye on it for a few weeks to see if the street remains clear, then try taking it down to see if cars return. Better yet, try moving to a different street to see if it has any effect on those streets. We currently run a wide-open comments policy, because it makes things more entertaining. But every so often we get comments by naive idiots, today's being "Peacy Combson" commenting on Lockleaze. Lets exchange the links between our websites.. The site we are requested to link to is some US-centric car web site that is currently comparing the Porche Cayenne with the BMW X6. 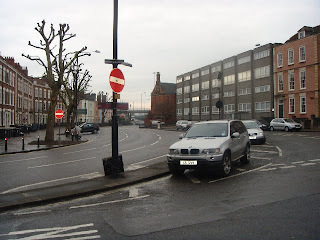 Given that our only criteria for comparing them would be which has to park more on the pavement or how best for a passing cyclist to take down their wing mirror without damaging their forearm, linking to this site is not possible;. instead we 've just left the email address up for the spam harvesters to find. Sorry -but those who live by spam deserve to drown in it. Some random car-loans site has also just tried to link to us, but it wasn't even funny enough to deserve criticism. Straight in the bin instead. We consider these feeble attempts to get lisnks from our site to be a metric of success. We only link to local web sites, journalism sites like Crap Cycling and Walking in Waltham Forest, or spoof sites like the Association of British Drivers. We do regularly accept suitably entertaining photographs of Bristol streets, ideally with matching commentary, but not necessarily. Ideas from elsewhere that we can adopt are also welcome. The contribution policy is documented. Have you noticed that car manufacturers are using more and more extravagant advertising techniques to sell their product? You’ve probably seen all the flashy computer-generated ads on telly (the ones which probably digitally paint out undesirable things like traffic jams etc) or if you’ve been to the cinema recently, you’ll have sat through endless versions of the same ads on the big screen. They like to project images of how luxurious and comfortable driving can be. Now with the current economic downturn making driving expensive and the rising tide of congestion in Bristol, you’d think that it would be a great opportunity to get folks out of their comfy lounges-on-four-wheels and onto public transport. But the government have decided that taxpayer’s cash can be used for car loans and the ad campaigns continue unabated. 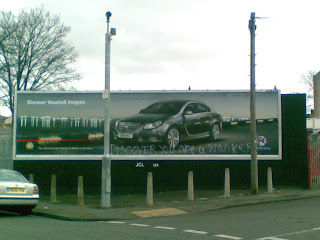 So it’s comforting to see that someone in Easton isn’t buying into the psychology of car adverts. Oh, and by the way Mr Chancellor, would you mind handing out some taxpayer’s cash to me so I can buy that carbon fibre road bike I fancy?. Back in December, there was a shocking expose on Lockleaze, Bristol's forgotten quarter. With high unemployment and very low school completion rate, it's deprived, though not necessarily as much as some other parts of the city. It's just less known, less feared,and gets less attention. Hope is on the way though. As the article says, it has been discovered and the council is planning "a programme of housebuilding and investment which will take 20 years to complete but should bring new life to the struggling area." 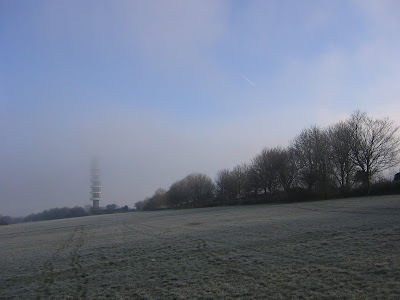 This is Purdown Camp, with the the tower in cloud. The mud is frozen today: Eismud. Here's the view into "Lockers". This field is very popular with dog walkers during the day, mini-moto riders in the evening. It is good fun to race them on your bike and it is generally jovial. Further along, looking at the M32. 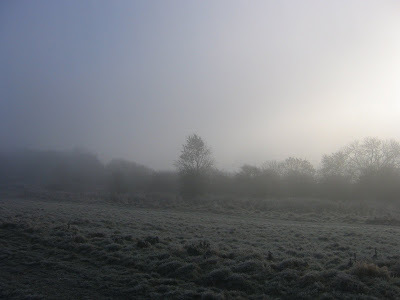 The morning fog prevents it from being seen, there is just the permanent background buzz of traffic the area. Perhaps that is why the park is not a major destination at weekends the way Ashton Court is. All that will change in the future. 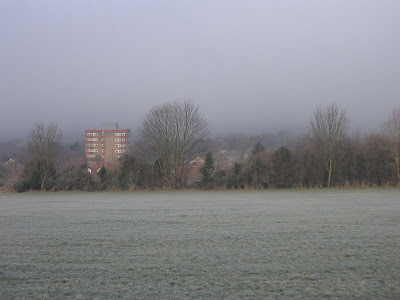 The neglected urban wasteland viewed in these pictures will be regenerated by fulfilling Bristol's central-government-imposed quota for 117,000 new homes. In years to come, when commuters sit in the M32 traffic jams. they will be able to look up the hillside and see a new Lockleaze growing out of the ashes and wasteland of these green fields. It's worth remembering here that the plans for thousands of homes aren't coming from the local councils. Nobody says "look, we have a flood plain near Lower Ashton, let's do 10K houses". Nobody says "look, these fields aren't profitable, let's put housing up. Instead they've been given a quota for houses from above, and expected to sort it out. S, Gloucs. were overjoyed at the opportunity to stick a lot of these in behind the MOD, as it would tick off a big slice of their quota without impacting the rest of the area. But are the fields and greenery in the city, near Lockleaze, below Dundry something we in Bristol ought to value more and fight to preserve? 19:30 23/01/2009, the Cube Cinema is having a fixed wheel night, with US films enjoying the sport, art and some music in the bar. Fixed wheels aren't that mainstream in Bristol, on account of the hills. Presumably all eight fixed wheelers and anyone with a broken freewheel can turn up, and MTB-ers with a single-speed bike can turn up as semi-committed. Could be a fun evening. Not just water, gritty water, giving it a feel of Alpine glacial runoff, or maybe a Scottish river crossing in one of the empty glens, a crossing that would leave your feet numb for the next few hours. 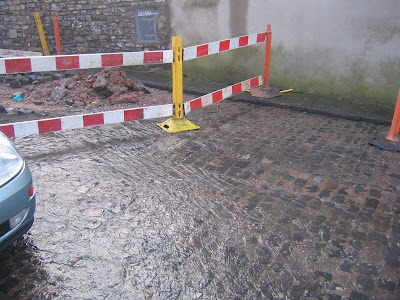 When combined with all the other MTB facilities in the area -the steps, the cobbles, the downhills, the water mains leak (for that is what it is) is creating an urban-MTB-fun-area without any mud to deal with afterwards. This is something we should be proud of in our Cycling City. 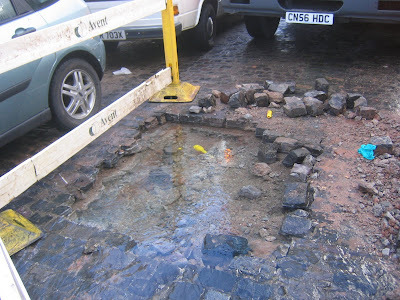 Since then, someone came and dug up somerset street, fixing the water leak. All the cobbles are back, the wild feel of the road lost. Never mind, it was good while it lasted. Some more research into the mythical Boxing Day staircase race turns out that it was never a race, just a fun ride, through the stepped streets of Kingsdown. That's a tradition to bring back, down Spring Hill. Normally that only gets coverage here at the top, where it becomes gentle enough to allow motor vehicles to park across the road. Further down, it's stepped. The middle section has some barriers at the top to stop you entering at speed, but then there's a fairly straight run with a dropoff to Dove Street, one with inadequate visibility to be sure there isn't something about to run you over. This is a number of flights of stairs, none on their own too hard, with some runouts to allow you to change your mid or just drop a bit of speed. It then levels off into a good runout stretch into the dispersion zone that is King Square. This would be a great place for a Downhill Race, "Kingsdown Technical". The square would be where the finish would be, the audience would get a fantastic view of the bikes coming down at speed. This is something to think about. It would be an exciting Cycling City event - a downhill run in the heart of town, where anyone can come to see it. It would make for some great photos of the city and make up for some of the bad press it's been getting in the cycling world, with its recent war-on-pavement-cycling. Hold the event on a Sunday and there's no through traffic to speak of; closing the roads wouldn't be hard. And if it can't be done officially, it would be a good night-time event.